To paraphrase Dan Aykroyd, when the light turns green, the power's clean. 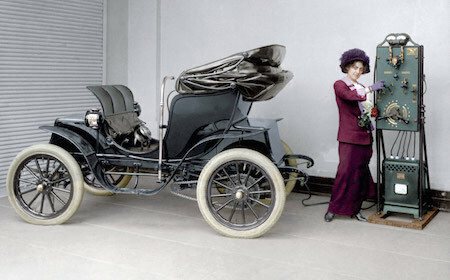 Charging a 1912 electric car was a bit more of a chore, but check out the steampunk charger! John Jacob Astor IV gave an intriguing look ahead at the future of electric cars (both the 1912 future and the 2019 future) in A Journey in Other Worlds (1894) by describing wonderful "electric Phaetons" that could roam everywhere. Even then, it was apparent that some means of keeping them charged would be needed.